A 22-year-old college student in China was eating some ice cream last week while she walked back to her dorm room. 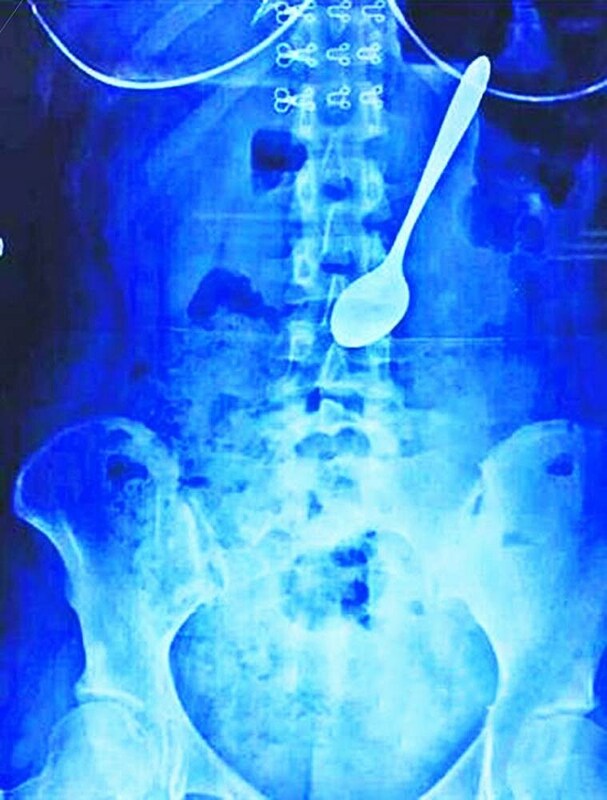 One of her friends startled her so badly that it made her scream and accidentally swallow the spoon. Zhang Weiwei says she just felt a little bloated, so she was going to go to the hospital, eventually. The spoon was five-and-a-half inches long, an inch wide, and made of metal. Luckily she Googled it the next day and was shocked to find out how serious her situation was. Even kids in China need the Internet to figure out your body can't digest large pieces of metal. Zhang finally went to the hospital the day after that with the spoon still lodged in her stomach. Doctors were able to get it out with a wire lasso they shoved down her throat, the whole thing took ten minutes. Zhang didn't even suffer any internal bleeding. But she has a sweet X-ray to show for it.